There are 6 official languages in use in the Free State. Grade 3 learners in 5 districts in the Free State had an enjoyable opportunity to write books in 5 of these languages. They illustrated the books themselves. 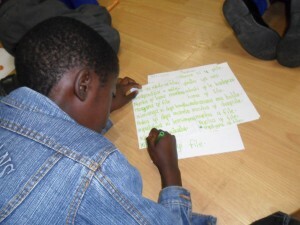 Here is a learner writing his own book.. The stories, all written using right brain techniques, are all highly original. They will be great reading material for other foundation phase children. The Free State Department of Education expect to launch these new books in January 2013.